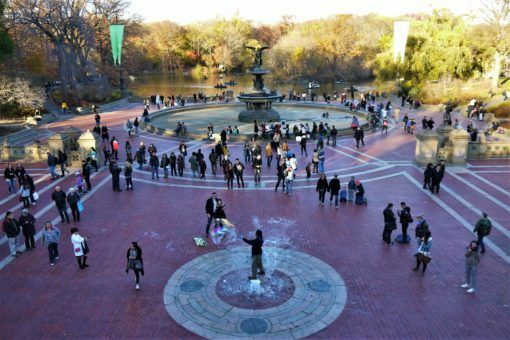 You could spend a whole day relaxing in Central Park, wandering its tree-lined paths amongst dog walkers and joggers, buskers and kids playing basketball. Take a picnic with you or sip coffee in a park café, you can even paddle across the lake on a rowing boat and take some photos of the serene leafy scenery topped by skyscrapers. Catch a boat from Battery Park and sail across to the iconic Statue of Liberty. We loved the excellent audio guide that told the history of the statue as we circled her on the island, getting views from all angles and across the water to the city. Next, we hopped across to Ellis Island where we spent hours hearing and reading about the first wave of people who left their homes behind and sailed across the world to build a new life in America. 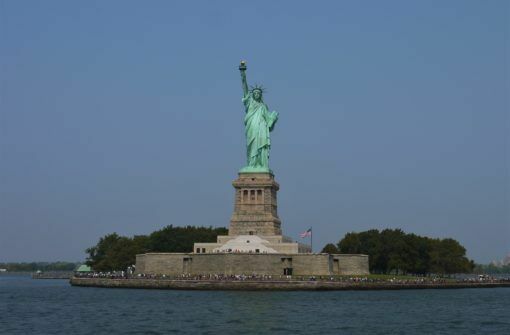 Cost: A statue cruises trip to Liberty and Ellis Island costs $18.50 (£12 each), you can buy tickets from the Statue Cruise website. The Big Apple is a great jumping off place for other top US cities which you can visit on a road trip, by bus or on a tour from New York. We travelled from NY to Boston, a quirky city full of history. 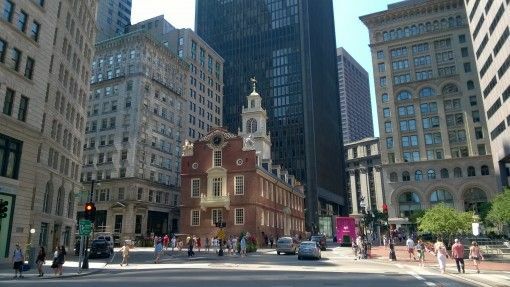 Highlights included tasty food at Quincy Market, walking the Freedom Trail, visiting the Tea Party Museum and a free black history tour. We also visited both Washington DC and Philadelphia, where we experienced world-class museums, caught a glimpse of the White House, toured the Capitol Building in DC and learnt about US history at Independence National Historical Park. 9/11 was such a huge event in US and world history and I believe all visitors should take the time to visit this harrowing, yet reflective and uplifting museum. It’s located underneath the area where the Twin Towers once stood, which is now a memorial park featuring huge square fountains engraved with the names of the those who died. Next to them, the new One World Trade Center stands as a symbol of the city’s resilience. You can buy timed tickets for the museum, which features an eerie collection of artefacts such as missing posters and wrecked fire trucks as well as interactive historical exhibitions, audio booths and short films. There’s a beautiful In Memoriam exhibition which displays portraits of the victims. You can read more about our moving visit to the 9/11 museum here. Cost: $24 for adults, we paid £16 per person. Tickets can be reserved up to six months in advance via the official 9/11 museum website. 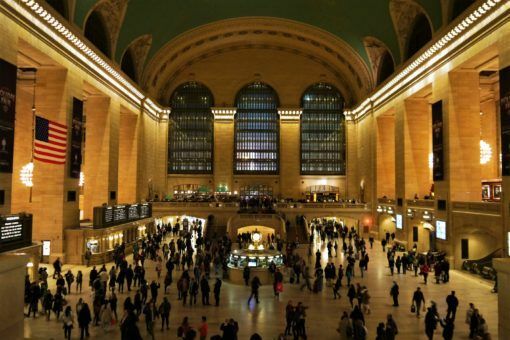 Don’t miss this stunning architectural treasure, a cavernous terminal that’s more like a cathedral than a train station. Built in 1913, the zodiac ceiling in the main concourse is decorated with constellations and features the iconic opal clock. Today, there’s also a huge market and dozens of restaurants to check out. This museum is a great place to learn about the history of the city, how it evolved into one of the busiest ports in the world and became one of the most famous destinations on the planet. The museum tells the story of immigration and architecture and has special exhibitions, we enjoyed the New York Marathon photo exhibition when we visited. Cost: suggested donation of $18 per person, find out what’s on at the official museum website. 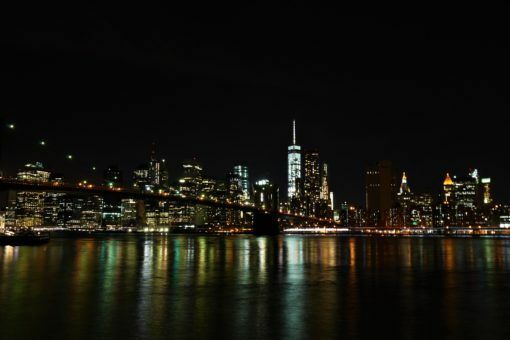 To really get a sense of New York’s immense size and catch a glimpse of its iconic skyline, head to either the Empire State Building or the Rockefeller Center. We rode the elevator to the Top of the Rock for incredible views over the grid-like streets of the city and Central Park and in the other direction, of the new World Trade Center, Battery Park and the sea. Andrew’s relatives who we stayed with also took us to the Dumbo area in Brooklyn, where we got some great night-time shots of Manhattan and the Brooklyn Bridge. 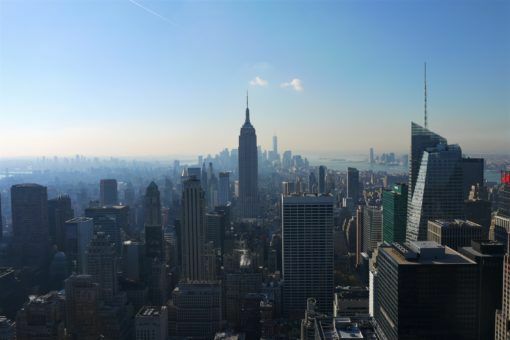 Cost: $28 (£21.32 per person) for tickets to the Top of the Rock, which you can buy from the official website. Have you been to the Big Apple? 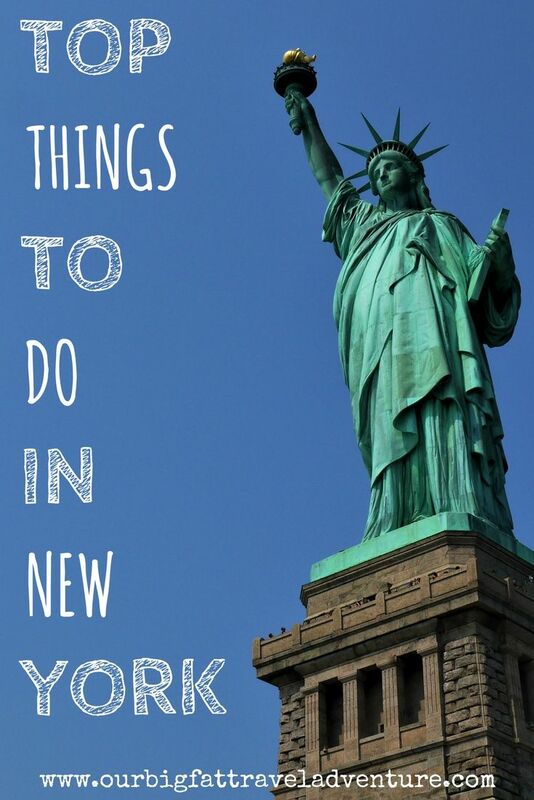 What are your top things to do in New York?